Protected by two patents – one for its construction and the other for the play-reducing gear teeth – this gem of horological engineering alone comprises no less than 24 jewels and is equipped with three play-reducing wheels. 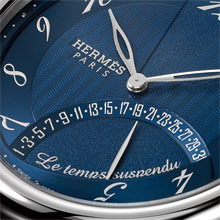 The running time and suspended time phases are coordinated by two synchronised column wheels, one driving the hours, and the other the minutes coupled with the date. The 360° retrograde hour and minute mechanisms make time disappear without interrupting the relentless running of the movement. 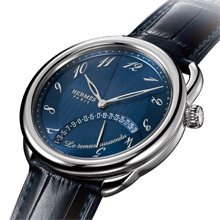 The herringbone guilloché dial motif bears the Hermès hallmark, while the contrasting retrograde indications are enhanced by a delicately grained finish. 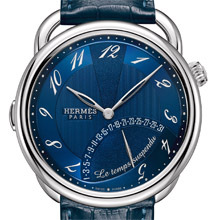 The asymmetrical design created by the winding crown placed at 2 o’clock hints that harmony can stem from paradoxes… Such as that of deliberately eclipsing time before willingly rejoining it.